Writing preschool lesson plans can be time-consuming and confusing. But it doesn’t have to be. 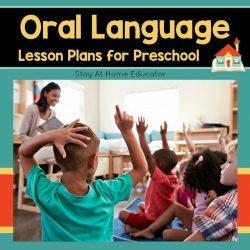 This five post series lays out everything you need to do to write year-long preschool lesson plans an entire year in advance. In just five easy steps, you’ll have an entire year of preschool lesson plans written in up a single afternoon. This post included two FREE printables to help you with your preschool lesson planning, so be sure to grab them at the end of the post! (And be sure to read the entire series for more free lesson planning printables). This is the second of five follow-up posts about how to write preschool lesson plans for an entire year. 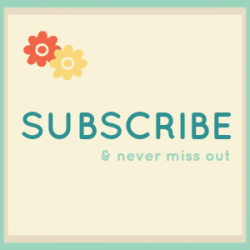 Be sure to subscribe and follow along on social media so that you can also get the BONUS POST! No matter your teaching philosophy, good instruction stems from some advance planning. That is not to say the excellent teaching doesn’t ever happen in the moment, but your very best teaching will almost always draw from your lesson plans. This is why I believe so strongly in having a preschool scope and sequence to follow. A scope and sequence is an outline of skills and concepts you plan to teach throughout the school year. This kind of planning helps you identify what needs to be taught, but also the order. Many skills are incremental, with one skill or concept will building upon another, so it is only appropriate that your lesson plans reflect a specific order. You can grab a copy of the exact scope and sequence I use at the end of this post! 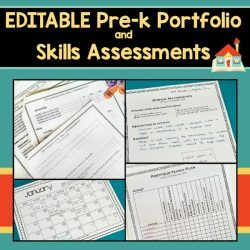 With a scope and sequence in hand, writing your preschool lesson plans for the year will be a breeze, and you can get it all done in a single afternoon. These lesson plans will be detailed enough to take the guesswork out of what you should teach every day, but still flexible enough that you can make appropriate changes based on the needs and interests of your students. If you haven’t read Step 1: Create A Calendar, then you should do that, and the tasks in it right now. You definitely want to have your calendar solidified before you do these new tasks. There are a couple different approaches to teaching reading in preschool. Neither of them are right or wrong. The approach you choose is simply based on what your students need and how well it fits in with your own teaching style. State/Common Core Standards Or “Mom” Standards? I discussed this idea when I posted about how to select learning materials for a preschool co-op. Most states have some sort of preschool standards from which you can use as guidance. To align with early childhood development, these standards tend to focus more on social, emotional, and physical development. Any academic skills cited are typically vague. The second approach is to create a set of “mom” based standards that reflect what you personally believe your child should be learning. 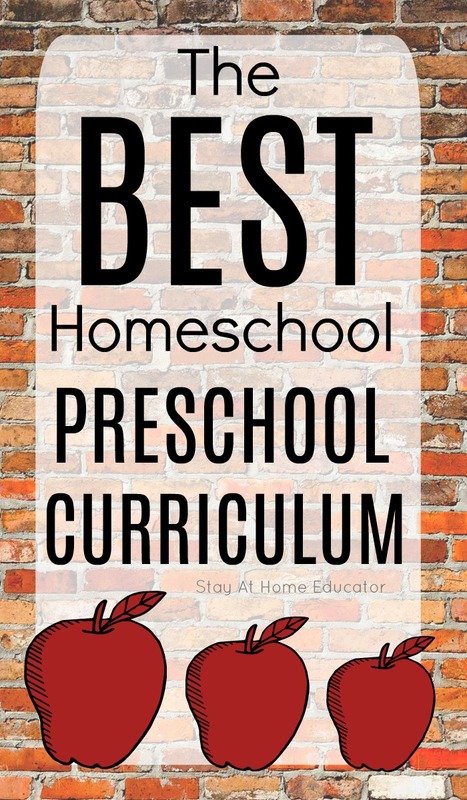 You might find yourself gleaning from state or common core standards, as well as incorporating several skills and concepts that you believe are appropriate for your child. Either approach is fine. It is a matter of personal preference. The important thing is to have a set of goals appropriate for your child that you are choosing to follow (and possibly tweak as need dictates) for the year. So, how will you teach reading? There are basically two schools of thought when it comes to teaching reading in preschool. Letter of the week (phonics) approach or whole language. Letter of the week is much like as it sounds. A new letter is introduced each week and much of the literacy instruction is centered on that letter names and sound. The whole language approach introduces letters to preschoolers more naturally and often times after a child has developed an interest in that specific letter, such as the letters in their name or the letters in their favorite cereal. There are advantages and disadvantages to both approaches. 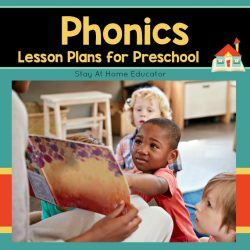 Many educators now look for ways to use phonics as part of whole language instruction, striving to teach meaningful phonics in the context of literature. This is how to take on both approaches. 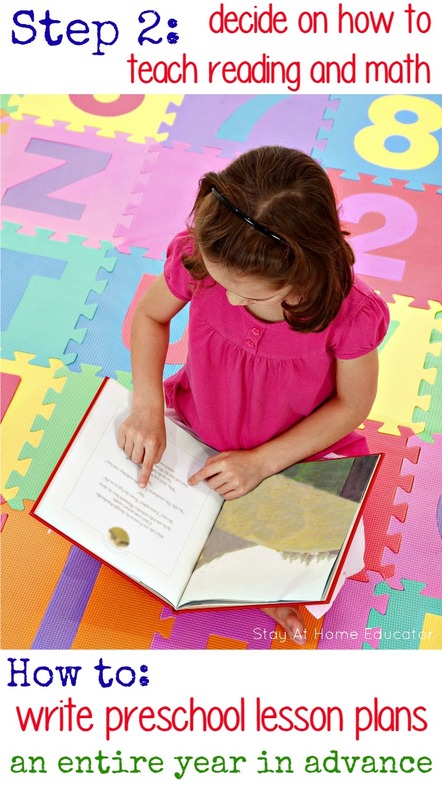 Want Affordable Preschool Reading Lesson Plans? 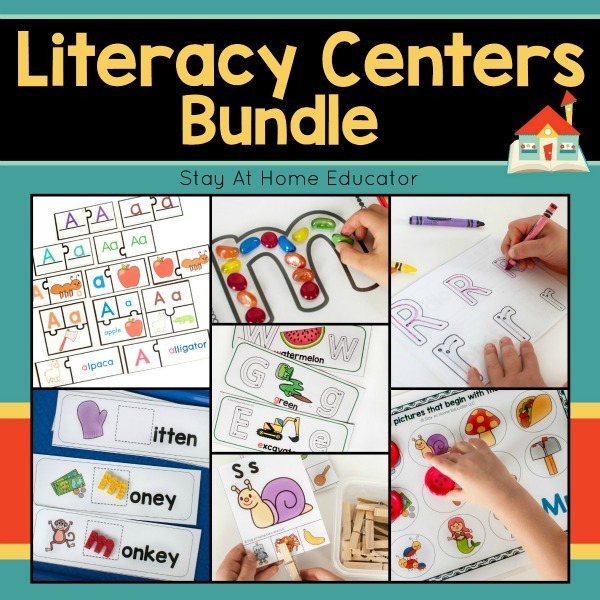 You can also grab my preschool literacy center bundle! All these activities support my preschool curriculum. You can buy them individually or save money in a bundle! Find them in my Teachers Pay Teachers store, too! A comprehensive math curriculum will include more than simply counting. For my math instruction and sequencing, I rely heavily on Teaching Mathematics in Early Childhood by Sally MooMaw. It is a fantastic book about how to teach early mathematics fundamentals in a play-based manner. In the back of the book are two scope and sequences of skills for parents and educators to follow, so you know when specific skills are appropriate to teach and it also demonstrates how those skill activities build upon one another. I love this book! And it is from this book that I created a scope and sequence that you can grab in this post! There are five disciplines of math (number sense, algebra, geometry, measurement, and data analysis), and I spiral through each discipline focusing on one discipline each week, (with the exception of data analysis for my 3-4′s class, which I don’t introduce until the second half of the year). So, that means that week one I focus on number sense skills, week two algebra skills, week three geometry, and so on. Then, we loop through those disciplines again and again until the end of the school year. Now, this does not mean that only that discipline is taught during that week. It is only the focus of my math instruction. I teach the same focus concept for the entire week (both days of preschool), and we typically even do the exact same activities on the second day of preschool as the first. It has been my experience that preschoolers enjoy the repeating activities on the second day of instruction because it allows them to continue to develop mastery, which boosts their confidence and self-esteem. When possible, I like to keep math activities theme related. But, these activities, while listed out and “planned” for, are not set in stone. I allow myself the freedom to make changes or ignore them if I think of something better, or if my students request more time with a specific concept or activity. Once these activities have been introduced, I keep them out and available to my students to refer to during math center time so that my students have even more time to practice and reinforce specific skills. At any one time, I typically have three to four activities set out. It works well as most of my math instruction is play-based and hands-on. 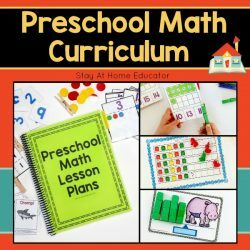 Want Affordable Preschool Math Lesson Plans? I have written my own preschool math lesson plans. Like my reading lesson plans, this came about out of necessity. 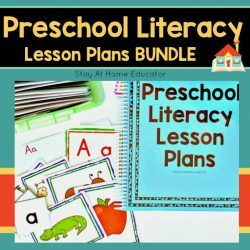 You also get a BONUS preschool literacy scope and sequence for the year with this download. Each template in the following file is slightly different and which one you choose to use is dependent upon how much detail you want filled in for you. There are two levels, 3-4’s and 4-5’s class templates. And there are two versions of each template. One version is a template of math content to cover at it’s most basic form, and the second version offers topics within each math discipline to cover. Click the image below to get your templates. Oh, and might I mention that they are fully editable, too! As in, you can just type right in them, or you can still print them out and write the activities in by hand. At this point, you will only be filling out part of the template, and you may find that you’d rather wait to fill it out. First, decide if you’d like your math activities to be theme related. If you do want them to be theme related, then wait, and just fill out what concept you’d like to focus on under each weekly discipline. If you prefer not to have your math instruction be theme related (believe me, it can be exhausting and require a ton of extra planning and preparation), then you can begin filling out the template. Let’s look at the Math Scope and Sequence 3-4’s as an example. For week one, the discipline is number sense and the concept is counting. 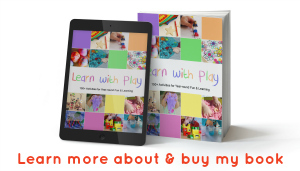 So, you might write in a quick counting activity such as Apple Drop Counting, It’s a Zoo, or Dot Counting Cards, or you can do something even more basic like rolling a die and pushing the corresponding amount of buttons into play dough. Choose or make up a counting activity, and write it down. The discipline for week two is algebra, and the concept is sorting. What kinds of sorting activities would your child or preschool students enjoy? Consider any one of these activities. Continue writing up activities until the template is full. If you want to plan your math instruction so that it aligns with a theme you are also teaching, that is great. STEP 5: ORGANIZING LESSON PLANS – BONUS! What a great resource, Sarah! Thank you for including Reading the Alphabet in your reading resources. 🙂 Off to pin. Hi there! I am just loving these posts and I am one of your newest followers. 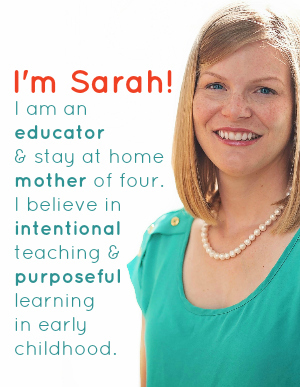 I teach a preschool in my home 2 days a week similar to you. I’ve been doing it for several years but this year I was hoping to refresh and renew my concepts and planning. Then I stumbled onto your blog and I am so excited! I would love to know more about your sequence of etching reading. I struggle beyond teaching letters/sounds/rhyming/sight words. 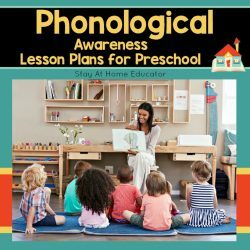 I would like to focus more on phonemic awareness but I’m not sure what to teach or how to sequence the skills. Any help in this regard would be fabulous! I am going to put your math template to good use for sure! Thank you so much. I really love your blog, and this series is wonderful! One question RE: the scope and sequence templates. Template #1 for both age groups is the same template. Is there a different one for the 4-5’s? Thanks! i’m so glad you are enjoying my blog! Yes, there is a slight difference. The difference is that the 4-5’s templates have data analysis as a math component. It gives the preschoolers a chance to learn about making estimations and graphing information. The reason I wondered is because they’re both labeled 3-4’s. I guess if I had printed them out, I would have seen that difference, but didn’t notice it when I was just flipping back and forth between them on my computer. 🙂 Thanks for the clarification. Sorry for mislabeling them. You’re the first to mention it. I’ll have to fix it. Yes, they are within the post. There are a few to choose from. Do you use your literacy bundle with your 3s and 4s also? Yes, I use it for my 3’s, with the expectation that the lesson plans are more for exposure rather than mastery. In my 4-5’s classes I expect more mastery. Do your books come in book form? To which books are you referring? My lesson plans are a digital download. I am so grateful that I stumbled upon your blog this morning. I have been teaching Kindergarten to ESL students in Guatemala for 2 years and have to write my first scope and sequence this year! I have been very nervous, so I have been procrastinating on getting started. This resource is everything I have been hoping to find! You offer plenty of research, examples, and practical ideas. Even the book links you have provided look excellent, and I will be ordering those as well. I feel equipped to face the task now. You have taught me so much in such a short period of time… I can only imagine how much your students are learning with you every day!. Thank you so much for sharing your knowledge!